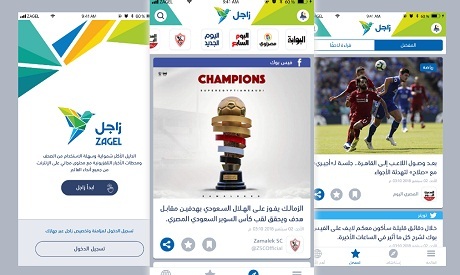 Clicks Egypt” Inc., for Information Systems, launched Monday a new news application for smart phones, named “Zagel”. The news application enables its users to follow the news feed of the day, from different Egyptian and Arab news sources. Zagel app targets utilizing updated technologies to offer a distinguished news service, which cover and update all the news of the day. The application alerts its users with top news once they are published on news websites. The application is easily downloaded by Android and IOS smart phones. It covers the updates of Economy, Politics, Sports, Entertainment, and Technology news, locally and Internationally. Zagel obtains the news from different news sources, the user is able to check the received news without having the smart phone connected to Internet. The tasteful designed application can be easily connected to the users’ personal social media and Email accounts. The application boosts users’ news search ability, it enables the users to control their news feed and pick their preferred news topics. The application allows users to pick their news from all fields, Economy, Politics, Sports, Entertainment, Arts and Culture.